Map skills are critical components to a social studies curriculum beginning in elementary school all the way through college. Over the last 20 years, maps have evolved from charts that roll down from the top of a chalkboard to virtual displays that are interactive and engaging. Adding to the platform of electronic map resources is a website called MapMaker Interactive, which is sponsored by National Geographic. This free website allows teachers and students to find locations anyplace in the world and cover a specific area with layers of data including food production, human population, climate, and economy. Additionally, the MapMaker website includes several annotation tools to measure distance, to identify capital cities, to add lines of text, and much more. After the map has been tailored to one’s liking, the final product can be saved and shared via email. This is a great way for students to customize maps and send them to their teacher to demonstrate their mastery of map skills. Likewise, teachers can create maps and email them to their students as a way to model quality map skills. 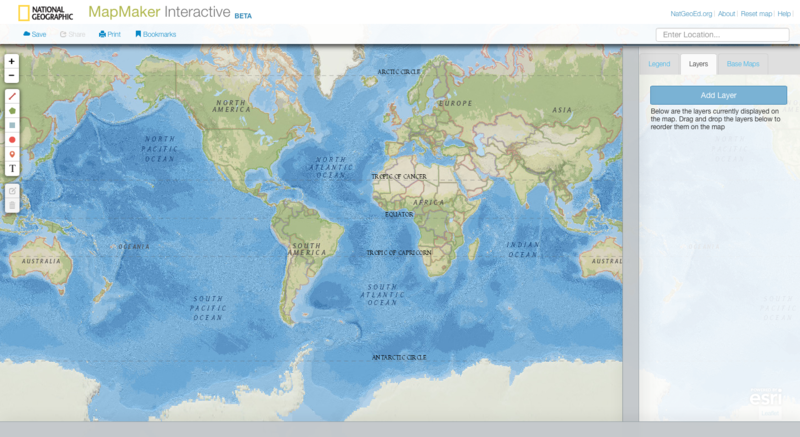 Click here to view the National Geographic MapMaker website.